You’ve gone on a long road with this film, but television fans really became aware of the project when you launched the Kickstarter for SHOWRUNNERS. How did it originally come about, and at what point did Kickstarter come into play? Des Doyle: I got some initial funding from Ireland — I’m from Dublin, Ireland, originally — and we came over and started shooting around fall 2010. That was very challenging at the start because we didn’t know anybody, nobody knew us, and trying to get to people [wasn’t easy]. But eventually we did, we shadowed some people, and they were like, “Yeah, this looks pretty interesting.” So they allowed us to continue. What Kickstarter really helped us with is finishing the film. We had basically shot everything, but we didn’t really have the money to finish the film. So thank you everyone on Kickstarter for helping us finish the film! And that process took a little bit longer than we thought it would as well. Ryan Patrick McGuffey: As it always does. DD: Yes. We’re very, very happy with the finished film. We’ve had a fantastic response from the showrunners who have seen it…so hopefully the fans will love it as well. What made you initially decide to focus on showrunners? RPM: Original TWILIGHT ZONE. Let me rephrase that. [Laughs] The reruns of TWILIGHT ZONE and seeing Rod Serling, and knowing he created, wrote, sometimes directed, and introduced, produced, and edited [the show] — the job killed him. I’m sure the smoking didn’t help, but he’s literally one of the original examples of what a showrunner was early on in American television. [SHOWRUNNERS] originated with Des, really. He came over and we were working on a film festival together in Los Angeles. He was fascinated and he has this seed of an idea. But it was inspired by the fact that we wanted to know more about these guys. And there hadn’t been a film about them — and why is that? How hard could it be? DD: Because it’s very, very difficult to make a film about them! Showrunners have, traditionally, fairly insane schedules. Which one was the most difficult to pin down to actually get them for this film? DD: There were lots of difficult ones. RPM: They’re all very important, very busy. DD: Unfortunately, there were some people who agreed to take part in the film that we would have loved to have had, but we could never make the schedules work. But the people that we did get, persistence pays off to some extent. RPM: It doesn’t hurt to have friends who know them. Sometimes it was pure circumstance, like life opened a door. We were walking out of the FRINGE offices and we run into [BUFFY THE VAMPIRE SLAYER/ANGEL/ FIREFLY/DOLLHOUSE creator] Joss Whedon doing post[-production] on THE AVENGERS. Literally. And two of his writers from BUFFY were in the film already — [HUSBANDS creator] Jane Espenson and [SPARTACUS creator] Steve DeKnight. So we had a little sidebar, and it was like, what do we do, what do we do? And then we hit him up on the spot, and he was like, yeah, talk to my assistant. And then we shot it like the day after AVENGERS premiered. DD: That was one of those karmic moments. RPM: That was a karmic moment. RPM: He’s certainly a prime example of that. Lovely, lovely guy. DD: But unfortunately, some people — it took us six months to get to one person. It was worth it. It was really worth it. We had gotten to Hart Hanson [creator of BONES/THE FINDER/BACKSTROM]. We had a great interview with Hart, and then I kind of ambushed him at the end and said, “We’d love to come back and do some more with you.” I kind of pitched him what we wanted to do. And he said, “I think that would be very difficult to set up, but I’ll try and help you do it.” So that took six months to make that stuff happen. But it’s great that it did, because it really gives the film — you can really get a sense of what the job really is. RPM: A day in the life [of a showrunner] from start to finish. DD: But Hart’s awesome. Hart’s been an amazing supporter of the film. The great thing about speaking with showrunners — at least in my experience — is that you can often come out of an interview looking at a show in a whole new way. After spending so much time with so many different showrunners, are there any shows you’re viewing in a new light? RPM: That’s a good question. DD: Yeah. An entirely new way, maybe not, but my level of respect and admiration — which would exist previously — has gone up tenfold when you see some of the challenges the guys have to face. Using Hart as an example again, when THE FINDER was on, and THE FINDER was shooting concurrently with BONES, and THE FINDER was shooting in Florida, trying to manage that — even though he had [BONES showrunner] Stephen Nathan helping out profusely — trying to manage those two shows simultaneously shooting in different parts of the world, where you’re trying to divide up your brain space, is a phenomenally difficult thing to do. Unfortunately, that show didn’t go [beyond season 1] for whatever reason, but you have to stand back and admire anyone who can pull that off. People doing three shows. RPM: [Like] Joss Whedon. I knew it, but I didn’t realize he had [at one point] three writers’ rooms in the same building, just toggling between the three: the last season of BUFFY, the fourth season of ANGEL, and the first season of FIREFLY. DD: There’s a fantastic quote from him in the film in relation to that, which I’m not going to spoil right now, but believe me, it gets a huge laugh. But it’s very true about the job. RPM: I admire Jane Espenson, because she went off and left the TV space and to showrun her web series…not leave, but decided to take her project to the web space so she could own and control it, and do it the way she wanted to do it without the usual restraints of the broadcast system. DD: With [HUSBANDS co-creator] Brad [Bell]…Brad is obviously a huge part of that as well. RPM: Brad is fantastic, they run a great show over there. Big admirer of [Jane’s], and she den mothers her writers, too. The television industry does move fast, and in the time between you starting and the film coming out, shows have been canceled, showrunners like Jeff Pinkner on FRINGE or Mike Kelley on REVENGE left before their shows concluded. How were you able to address things like that in the film? DD: That was a challenging thing because things change so quickly. We do take into account that Jeff left FRINGE. We followed up with [FRINGE showrunner] Joel [Wyman] very, very close to the end of the show. We take into account that Mike Kelley has left REVENGE, and that Janet [Tamaro] has moved on [from RIZZOLI & ISLES]. But there does come a point where you can no longer play catch-up. But the film…in a way, it doesn’t matter, because the film is not trying to be current with news in terms of a particular show; we’re trying to look at the job and the people that do it. So even though some of the shows are off the air, the information you learn and the people are so relevant to the job, so I don’t think it really impacts us that much. When you were doing these interviews, was there anything in particular you can share that the showrunners brought up that took you on a different tangent with the film than you might have expected when you first started off? DD: There’s a couple of things. A lot of people we were talking to mentioned that they felt women showrunners were very underrepresented in the industry. And because so many people were making a point about that, we looked into it, and we made the decision that we had to find a good number of [women] showrunners and say something about that in the film. RPM: They want their voices to be heard. They have it on a page, and on the shows, but to get to speak about their experiences as creative people in an environment like that is a tightrope. It’s stressful. And this gives them an interesting platform to speak out. DD: I do voraciously read everything I can about showrunners, and there are some things in the film I’ve never heard said anywhere else…I think people will be quite surprised by the level of candidness. Be sure to check out SHOWRUNNERS on VOD, iTunes, and in select theaters now! 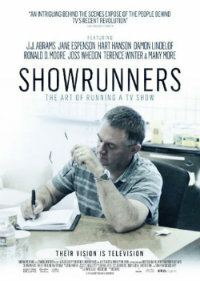 And be sure to check out the companion book, “Showrunners: The Art of Running a TV Show,” which features exclusive interviews with showrunners like Joss Whedon, Bill Prady, Damon Lindelof, and more.